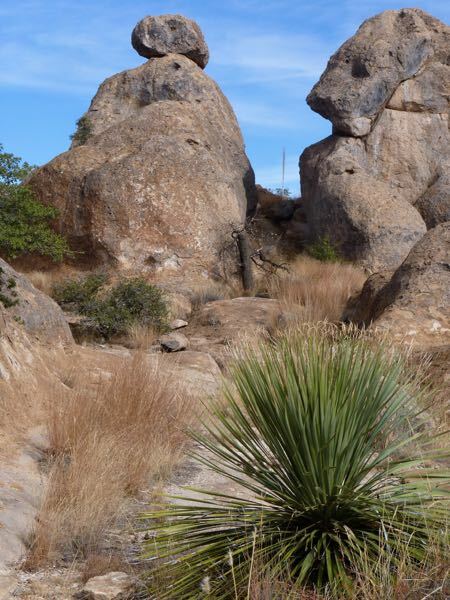 During a recent stay at City of Rocks State Park I hiked numerous times through the rock formations. It really was a fascinating place, with different views each time I ventured out. It struck me that there were lots of balancing rocks along the paths. I wondered if they were monitored for safety. Or, could they come tumbling down at any moment? Nevertheless, I climbed over and under, squeezed through, jumped around and thoroughly enjoyed myself. They were visually appealing regardless of any risk. The varied shapes, sizes, colors, textures and arrangements stimulated my imagination. So, I expect several paintings will result from the visit eventually. 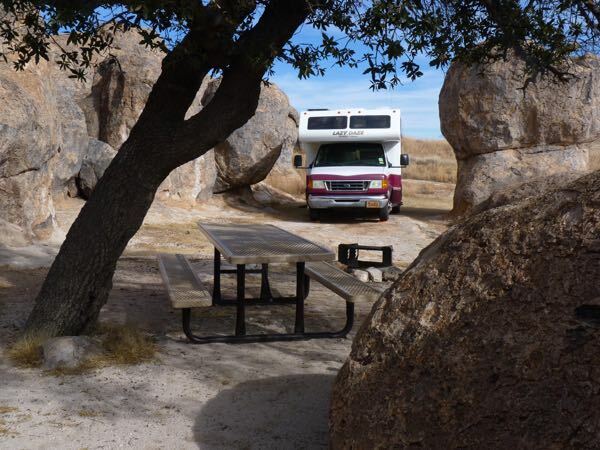 Some campsites were located right amongst the boulders. Spaces between the rocks conveniently provided easy access to the paths that wend their way through the formations. Despite not having hook-ups (my rig really didn’t need them) I enjoyed my time at this camp. And, Tardis seemed to fit in nicely between the rocks. 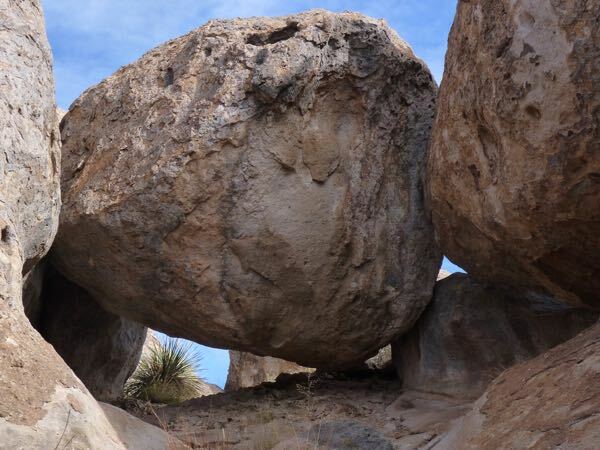 For more details about this park, see my City of Rocks post from last year. I missed a lot when I was there. 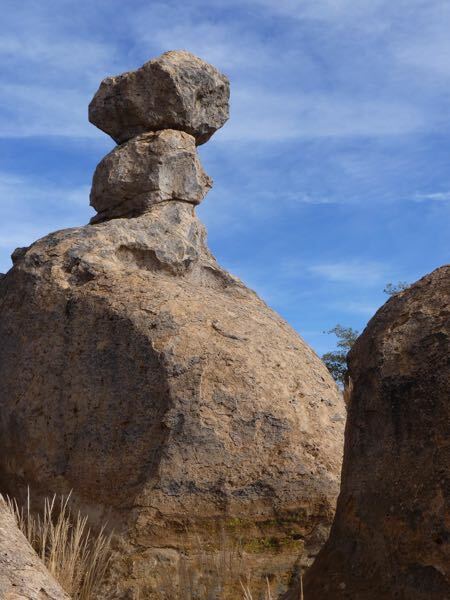 I do not recall but about three sets of balanced rocks. Maybe I need a refresher stay there. 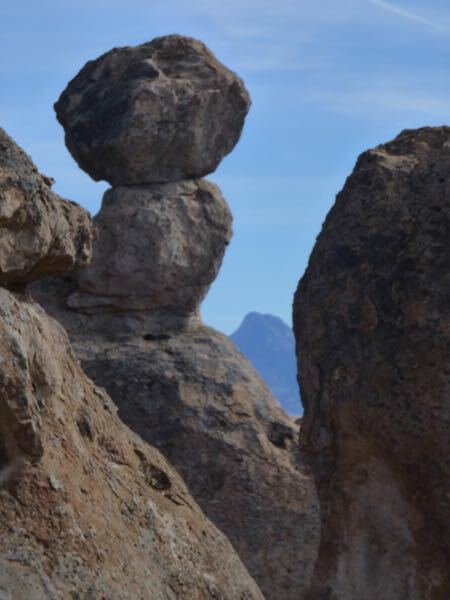 There are quite a few of the balancing rocks. I’m pretty sure there were more than I showed. It’s a really interesting place to roam around. 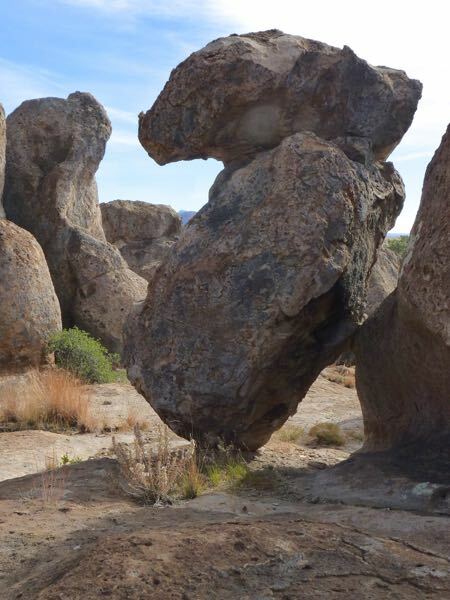 You show some really interesting rock formations in this post. It being a state park wouldn’t you imagine someone would be monitoring the safety of the rocks, for liability purposes if nothing else. I suspect you are correct Martha. It was just a thought that crossed my mind while wandering through the maze of rocks.